Script Tree - this is a window pane that sits along side the embedded browser and monitors its activity, displaying information as you browse. Playback - Once you have created your script, you can use Badboy's Playback functionality to replay the actions in sequence - and watch your browser browse through your site all by itself! Because Badboy records everything about the actions performed by the browser, playing the script reproduces exactly the same result that the original browsing caused. You can choose to play back your whole entire script, or you can play it one step at a time. 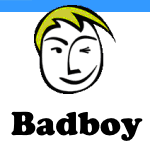 Badboy gives you lots of options including scheduling your script to play at any time in the future or even regular intervals if you want to monitor your web site. Variables, Looping, Data Sources and More - Badboy lets you easily parameterize any aspect of your captured script using Script Variables, making it simple to modify parameters to play back with different values. Once parameterized, Badboy automatically links new items to the same variable, minimizing maintenance as you record new items or change your script. The Data Source tool built into Badboy can load values from any ODBC compliant database, and Badboy has integrated support to loop over the values retrieved - thus making it The Toolbox - Badboy's features don't stop with capture and playback of requests - it offers you a virtual swiss-army-knife of tools for automating even the most difficult operations! With Badboy's suite of tools you can do almost anything. You can even create custom items of your own to place in the script and execute using Badboy's powerful automated playback engine. Support There are several channels for getting help with Badboy. The first thing to do is to make sure you have read the help file (under Badboy's Help menu) and the FAQ (you are reading it now!). If that doesn't help, the next best option is to post a message in the forum where you are very likely to get responses from Badboy developers as well as other users. If you prefer not to post in the forum, you can send a private message detailing your problem via the Feedback Page. Finally, if you are a paying user you can send an e-mail with all the details (including screenshots, scripts, etc) to support. In this case you will definitely get a response and we will work with you to try and resolve your issue. To get started with using the Badboy Ant plugin you first need to download the jar file containing the plugin tasks and place them in your Ant “lib” directory. For example, if you have Ant installed at “C:\programs\apache-ant-1.8.2”, then place the jar file in “C:\programs\apache-ant-1.8.2\lib”. There are other ways to do it but this is the simplest and most tried and true method. Once you’ve done this you’re ready to use the tags just like any other inside your build file.